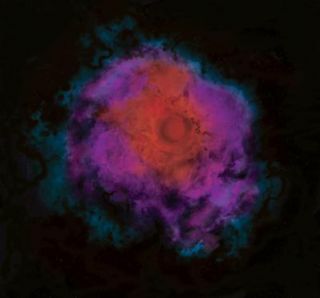 This artist's conception shows what an invisible "dark star" might look like when viewed in infrared light that it emits as heat. The core is enveloped by clouds of hydrogen and helium gas. A new University of Utah study suggests the first stars in the universe did not shine, but may have been dark stars. Whenthe very first stars lit up, they may have been fueled by the dark matter thathas long eluded scientists. These"dark stars," first born nearly 13 billion years ago, might stillexist today. Although they would not shed any visible light, astronomers mightdetect these invisible giants ? some 400 to 200,000 times wider than our sunand 500 to 1,000 times more massive ? because they should spew gammarays, neutrinos and antimatter and be linked with clouds of cold, molecularhydrogen gas that normally would not harbor such energetic particles. Ifscientists find these stars, they could aid the search to discover and identifydarkmatter. They could also help solve the mystery of why black holes formedmuch faster than expected. Scientiststhink unseen, as-yet unidentified dark matter makes up about 95 percent of allmatter in the universe. They know it exists because galaxies rotate faster thancan be explained by the visible matter within them. Amongthe main candidates for what dark matter is are WIMPs,or weakly interacting massive particles. One type of WIMP that scientiststheorize exists is called a neutralino. These particle can annihilate eachother, generating heat. They would also produce quarks and their antimattercounterparts, antiquarks, which would collide to emit gamma rays, neutrinos andantimatter such as positrons and antiprotons. Theresearchers calculated that in the newborn universe, some 80 to 100 millionyears after the Big Bang, as proto-stellar clouds of hydrogen and helium triedto cool and shrink, annihilating neutralinos would have kept them hot andlarge. The result might be dark stars, fueled by dark matter instead of nuclearenergy as in normal stars. These would have been made up largely of normalmatter, mostly in the form of hydrogen and helium, but would be vastly largerand fluffier than the sun and current stars. "It'sa completely new type of star with a new power source," said researcher Katherine Freese, a theoreticalphysicist at the University of Michigan. Originallyresearcher Paolo Gondolo, a particle astrophysicist at the University of Utah,wanted to dub these new, theoretical kinds of invisible stars "browngiants," similar to dim but smaller, Jupiter-sized stars known as"brown dwarfs." But he said his collaborators insisted on callingthem "dark stars," after the song "Dark Star" first playedin 1967 by the revered rock band The Grateful Dead. "There is a dark starsong by Crosby, Stills, Nash and Young, too, that we had in mind," Freesesaid. "Itwas a good name," Gondolo noted. Althoughdark stars are made up ?of less than 1 percent dark matter, "it's veryimportant," he explained. "It converts all of its mass to energy with100 percent efficiency, under Einstein's equation, E=mc2. Normalstars that rely on nuclear energy convert just a small fraction of its mass toenergy, 1 or 2 percent." Therewas initially skepticism as to whether dark matter densities were high enoughin the early universe to support the creation of dark stars. "However,we've checked it and so have two other groups, and they agree with us,"Freese said. Darkstars could be detected with the next-generation JamesWebb Space Telescope currently scheduled for launch in 2014. "It maybe that these stars eventually cluster together, and clusters of them might be visiblewith the James Webb Space Telescope," Gondolo said. Ifscientists do discover dark stars, "they would tell us a very importantthing ? that dark matter is made of elementary particles," Gondolo said. "At this moment, we know absolutely nothing about what dark matter is madeof. We know where dark matter is, how much is there, but we don't know itsnature." Darkstars might also explain why black holes formed much faster than expected.Astronomers have found black holes that existed only a few hundred millionyears after the Big Bang, yet current theories suggest they should have takenlonger to form. Dark stars might have collapsed into black holes very early,Gondolo said, because they might be very short-lived and could have formed whenthe universe was young. Inaddition, dark stars could solve a puzzle seen with stars in the galactic halo,the murky, roughly spherical part of the galaxy extending past the main,visible component. "There's an abundance of elements in the very old halo stars that's hardto explain, and dark stars can explain that ? they would end up creating thechemical abundances needed," Gondolo said. Itis unlikely any dark stars are being formed today, Freese said. "Theearly universe was more compact than it is now, and everything was denser,including the amount of dark matter one had at any one place," sheexplained. "Now the universe has expanded and things are less dense,making it harder to make dark stars today." Itremains uncertain just how long dark stars might live, Freese said. "Theones that formed in the early universe could have continued as long as they haddark matter to power them," Freese said. "They start at the center ofdark matter 'halos' ? giant spherical globes of dark matter ? and these arealways merging with other ones, so some might have burned out their dark matterfuel very early and become either normal stars or collapsed, but it remains anopen question if any have survived until now." YouDecide: What's the Greatest Mystery in Science?